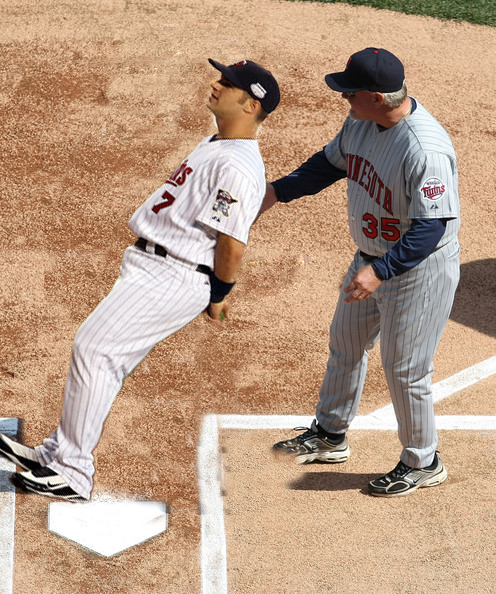 Mauer Replaces Quickswing With Trust Building Exercises | That's Twins Baseball. A Minnesota Twins Blog. Joe Mauer's Target Field Trust Fund is empty. TARGET FIELD — The Minnesota Twins came into the 2010 season with high hopes for the team and it’s brand new ballpark. While the ballpark has been nothing short of amazing to fans, some players are having trouble with how the field plays during games. There have been rumblings of the backdrop being too bright when the sun shines at a precise angle and that Minnie and Paul give off a glow that is distracting to the hitters. Weather has also been a complaint at Target Field, not because of the temperatures but because the ball hasn’t carried as well as the air conditioned blowing out, artificial environment of the Homer Dome. While most other teams and players seem to have no trouble bouncing balls off of David Kahns office or into the upper deck in left field, one Twins player is struggling to hit a ball out to the first row of bleachers. This player is none other than the reigning A.L. MVP, Joe Mauer. There’s been much talk to why Joe isn’t hitting his patented opposite field first row home runs and fans and coaches are getting worried. The worrying has led to numerous excuses being put forth such as nagging injuries and last season being a complete fluke. Hitting coach Joe Vavra took things to beyond ludicris levels last week when he offered up this gem of an excuse for Mauer…..
After reading that statement I now feel dumber and wonder why our so called powerful lineup has been underachieving most of the first half of the season. Mauer’s trust issues have led Joe Vavra to some drastic measures. Instead of starting the pregame workout with some Quickswing drills, Vavra now uses “Trust Building Exercises” with Mauer before games. We forgot to ask Vavra one important and confusing question. Why does Tolbert have more HR than Mauer at Target Field? Does he trust the field more? These questions will be addressed by the end of the season but for now let’s pray to whatever God you want that Mauer hits more HR at Target Field than Tolbert. If not, Mauer’s contract may have been the biggest magic trick in history…..other than the card tricks Cuddy does in the locker room.